Ever have one of those years you just want to stop, before the year's over? That's this year. I'm so done with this year. Can we start the new year now? I wasn't happy with the baby cardigan I had started with the CottonTots. So, I ripped it. 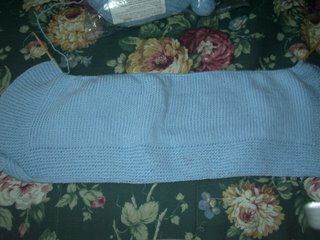 I started it over, but when I started it, I thought about making a pair of mommy and son socks out of it. Cheesy, yes, but KEEE-UTE! I'm just not sure how they'd turn out. Any suggestions or ideas? It's probably about 10 inches so far. It just takes so long. I have thought about ripping it out, and then doubling the yarn and using a larger needle, and just doing the whole garter stitch thing.